When we talk about data what we actually mean is events. The first task when installing CIMCO MDC-Max is to consider what machine and operator events you want to collect information about. Machine events can be collected automatically by CIMCO MDC-Max and most installations will include events such as Cycle Start, Cycle Stop, and Part Complete as a minimum. When these events occur at a machine CIMCO MDC-Max is automatically notified and data about the event is stored. 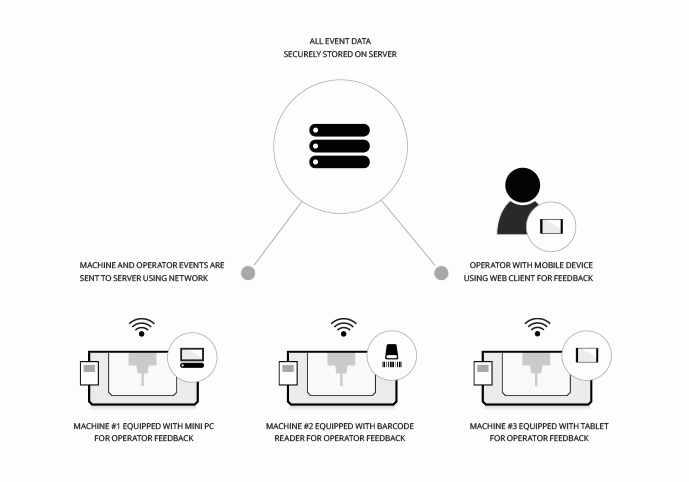 Operator event data is sent manually by machine operators. Using a smartphone, tablet, barcode scanner or PC an operator at a machine can send status information to CIMCO MDC-Max indicating specific events. Usually you want to collect downtime reasons such as Waiting for Setup, Waiting for Maintenance, Scrapped Part, Inspection, etc. CIMCO MDC-Max can be customized to collect specific information on any event. The following diagram illustrates how Machine- and Operator events can be collected and stored by CIMCO MDC-Max. In this example the CNCs transmit events through a wireless network, however, MDC-Max can be integrated with any existing wireless, Ethernet or RS-232 serial network. The majority of companies only want to know if a particular machine is running and producing parts or if it is stopped. With a basic data collection setup MDC-Max can show the amount of time the machine has been in production and the amount of time allocated to downtime. With the advanced data collection option MDC-Max can provide accurate reporting of machine tool efficiency on any job. MDC-Max can show the total percentage of downtime for each type of machine stoppage such as Tooling, Setup, Machine Maintenance, etc. This additional information is provided by the operator using a tablet or a barcode scanner. The operator uses the tablet or simply scans a barcode to indicate the downtime reason. This information can then be used to pinpoint exactly what is causing a loss of production.